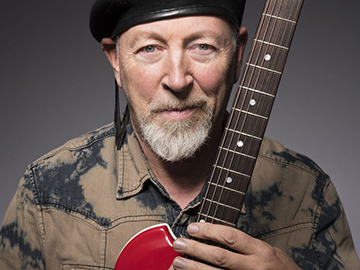 Folk legend Richard Thompson co-founded Fairport Convention in the 60’s with a group of friends and are regarded by many to have invented British Folk Rock. He went on to leave Fairport Convention to establish his own career, followed by a lasting musical partnership with his then-wife Linda. Since then he’s performed for over 30 years as a successful and popular artist who tours both with his electric trio and as a solo acoustic performer. Wickham Festival 2018 will close with The Richard Thompson Electric Trio on Sunday 5th August 2018, bringing 2018 to a fantastic finale. Named by Rolling Stone Magazine as one of the Top 20 Guitarists of All Time, this will be a something to look forward to all weekend. We are delighted Richard Thompson has agreed to headline. He is one of the most iconic musicians on the scene and someone who is regularly requested by our festival goers. His unique style and wide catalogue of songs will provide the perfect end to what we are sure will be another very successful event. In 2011, Thompson received an OBE (Order of the British Empire) personally bestowed upon him by Queen Elizabeth II at Buckingham Palace. In the USA Thompson has been nominated at the Americanas for both “Artist of the Year” and “Song of the Year”. HIs recently released CD, Still was produced by Wilco’s Jeff Tweedy which reached #6 in the UK charts (just ahead of Taylor Swift)! As an in-demand live performer, the past two years saw Richard Thompson headlining dates around the world as well as co-headlining shows with Emmylou Harris & Rodney Crowell as well as the Americanarama Tour with Bob Dylan, Wilco, and My Morning Jacket – which culminated with Dylan himself performing RT’s classic song “’1952 Vincent Black Lightning”. Thompson’s genre defying mastery of both acoustic and electric guitar along with dizzying energy and onstage wit continue to earn Richard Thompson massive new fans and a place as one of the most distinctive virtuosos in Folk Rock history. Thompson employs the “pick and fingers” technique where he plays bass notes and rhythm with a pick between his first finger and thumb, adding melody and punctuation by plucking the treble strings with his fingers. A true guitar legend and a real treat for Wickham Festival to enjoy! Richard Thompson - RT updated their cover photo. Richard Thompson - RT shared a post.